Popular throughout Mexico, Central America, and northern South America from at least 1200 B.C. through the arrival of the Spanish in the sixteenth century was a ball game in which players scored points by hitting a solid rubber ball past a marker without using their hands. In cultures such as the Classic Maya (A.D. 250-900), the game was a formal ritual with cosmological significance involving death and human sacrifice. The stone ball court represented the cosmos, the rubber ball the sun. By engaging in the ball game rituals and forcing weakened prisoners to play to the death, rulers reconfirmed their own prominent role among their people. 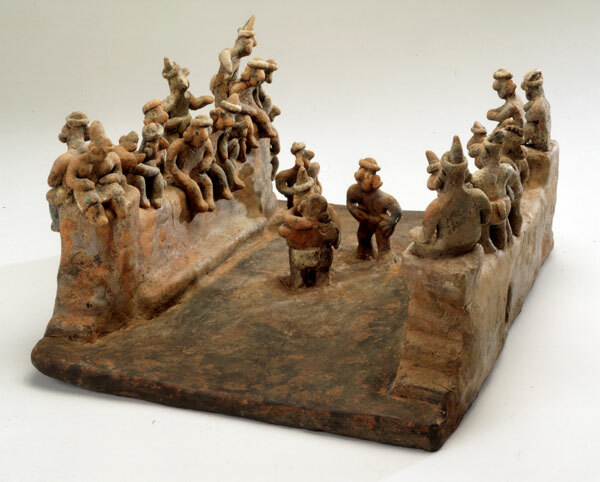 This dynamic scene from Nayarit in western Mexico is part of an artistic tradition of ceramic figures and clay scenes that were placed in deep shaft tombs as funerary offerings. The lively, crude rendition suggests simply a sporting event rather than a formal ritual.